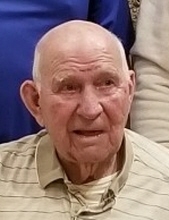 Robert C. “Bob” Hanson, age 90, of Plymouth, WI, passed away peacefully on Thursday (January 24, 2019) at St. Nicholas Hospital in Sheboygan. Bob was born on December 13, 1928 in Racine, WI, a son of the late Eben Hanson Sr. and Loretta (Grovogel) Hanson. He attended Bailey’s Harbor Grade School and graduated from Gibraltar High School in 1946. Bob served in the United States Army from 1946-1948 serving during the Korean War. On June 18, 1955 he married Florence Daubner at St. Rosalia’s Catholic Church in Sister Bay, WI. The couple has resided in Plymouth since their marriage. Bob worked at the Kohler Company for over 30 years retiring in 1990. He also made pickups and deliveries for Burkart Ford in Plymouth for many years. He was a member of St. John the Baptist Catholic church in Plymouth and served as an Usher in the Church for many years. He also served on the Plymouth City Council for many years. He loved to travel with Florence and made it to all 50 states and followed his son in the military to all stations of duty. Bob also enjoyed hunting and Golf, Golf and more Golf and he even accomplished the feat of a Hole-in-one. Survivors Include: His loving wife of 63 years: Florence; His children: Laurie (Robert) Oswald, Jeff (Betsy) Hanson, Tom (Kay) Hanson, Diane (Pat) Wolfert, Sally (Dave) Harvey and Rod (Jenny) Hanson. Grandchildren: Trisha (Scott) Arttus, Lindsey Nygaard, Justin (Beth) Oswald, Ben (Krista) Hanson, Matthew Hanson, Stacy (Derrik) Dippel, Bridget (Charles) Roethke, Emily (Spencer) Jacobson, Brad (Shayni) Hanson, Justin Wolfert (Special friend: Amanda), Megan Wolfert (Special friend: Jeff), Sam (Thiela) Harvey, Carissa Harvey, Katie Hanson and Leah Hanson. Seven great-grandchildren: Pearsen Arttus, Olivia Wolfert, Cade Dippel, Colton Dippel, Cody, Oswald, Tucker Hanson, and Zachary Jones. Brothers and Sisters: Larry (Agnes) Hanson, Eben (June) Hanson, Jim (Roseland) Hanson, Bill (Ginny) Hanson, Don (Judy) Hanson, Jean (Reuben) Widder, Peggy (Carlton) Kuehn, Helen (Jim) Abrahamson, Carol (Joe) Nelson, Florence (Don) Melichar, One Brother-in-law: Wallace (Barbara) Daubner. He was preceded in death by his parents, Brothers: Larry, Eben Jr., and Jim, Sisters: Jean, Peggy and Carol, Son-in-law: Mark Nygaard, Brothers-in-law: Joe, Jim, Carlton, Reuben and Ray, Sisters-in-law: June and Rosie, Great Grandsons: Cooper and Raylen. Following Robert’s wishes, cremation has taken place and a Memorial Service will be held on Saturday afternoon (Feb. 2, 2019) at 2:00 P.M. at the Suchon Funeral Home in Plymouth. Father Dennis Van Beek will officiate. Inurnment will be in the Parish Cemetery. Visitation will take place on Saturday (Feb. 2) at the Suchon Funeral Home from 11:00 AM until time of services. In lieu of flowers, memorials are suggested in Bob’s name for Rocky Knoll Health Care Facility. The family would like to send special thanks to St. Nicholas Hospital Doctors and Nurses and the entire staff at the St. Nicholas Hospice Care for all your care and compassion give to Bob and family. To send flowers or a remembrance gift to the family of Robert C. Hanson, please visit our Tribute Store. "Email Address" would like to share the life celebration of Robert C. Hanson. Click on the "link" to go to share a favorite memory or leave a condolence message for the family.